If you do not agree to all of the terms, conditions, and practices set forth below, do not access any Website or any of its pages. This Policy explains the types of personally identifiable information that is or may be collected by us on any Website, and how we use or share that personally identifiable information and other information. BirdShack is the sole owner of any information collected on a Website. (a) Registrations, Applications, and Other Forms: If you submit an application for a product, service, franchise opportunity, or information to us through any Website, BirdShack will collect and retain the content of the application that BirdShack receives, the email address from which it is sent, and our response. If you choose to complete such a form, you will be required to give verifiable and accurate business contact and identity information. This information is used to establish the identity of applicants and account holders, and will be retained. The information will, where possible, be confirmed by such methods as may be available to BirdShack from time to time. In the course of carrying out our franchising and recruitment process and seeking to improve the content of this Site, we may transfer your personally identifiable information and other information that you submit on this Website to our offices, affiliates, and service providers throughout the world. (b) Electronic Mail and Customer Service Forms: Please be aware that when you receive a receipt acknowledging your email or use of our customer service or application web forms, it means that the message has been routed into the Internet, and not that the message has been received by us. BirdShack may retain the content of any customer service or application web form or email that BirdShack receives, the email address from which it is sent, and our response. Content and other information related to e-mails sent by users to BirdShack may be used as testimonials or for other marketing purposes. (c) Orders and Purchases: BirdShack requests information from you on order forms, such as identity information, contact data, shipping addresses, and financial information. This personally identifiable information is used for billing purposes and to fill customer orders, and may be retained for record keeping and legal purposes, but will not be shared with unaffiliated entities except to the extent necessary to process and ship the user’s order or to fill the application. (d) Promotions and Sweepstakes: From time to time, we may also offer promotions or sweepstakes on our Website. When you enter a promotion or sweepstakes, we will require the submission of your name, email address and postal address. We will use this personally identifiable information for the purposes of administering the promotion or sweepstakes in accordance with its rules. Please note, sometimes the name, likeness, and other information is posted about contest winners in accordance with the official promotion or sweepstakes rules (but we do not publish your email or street address information) on the Website. (e) Bulletin Boards, Discussion Fora, Chat Rooms: From time to time, we may have bulletin boards, discussion fora, and/or chat rooms on our Website. When you post a comment to any bulletin board, discussion forum, or chat room, we will require the submission of a nickname and your email address. We will publish your nickname on the Website with your posting but we will not publish your email address on the Website. We will use your email address for the purposes of administering the bulletin board, discussion forum, or chat room, and ensuring your compliance with its rules. If you participate in a bulletin board, discussion forum or chat room on our Website, you should be aware that the personally identifiable and other information you provide there will be made available to others, potentially inside and outside BirdShack. Also, please recognize that the individual forums and chat rooms may have additional rules and conditions. Each participant’s opinion on a forum or chat room is his or her own and should not be considered as reflecting our opinion. Please use caution before revealing any personally identifiable information in any interactive media. If you provide us your e-mail address, mailing address, or phone number, we may send you information or call you from time to time with information regarding us, our products, or services, or with information about new products and services, promotions, or upcoming events that we believe may be of interest to you. If you do not want us to send you mail, e-mail, or call you to provide you with information regarding new products, services, or promotions, or upcoming events please see the section entitled “Your Information and Opting-Out” below. We use IP addresses and web server log files, and Information to analyze trends, administer a Website, track users’ movement, and gather broad demographic information for aggregate use. Information of this type may be combined with cookies or other sources of information for these purposes. Specifically, through the use of web server log files, any or all of the following information may be accessed, collected, analyzed, and stored during or after your visits to our Website: the name of the domain from which you access the Internet; the date and time you access our Website; the pages that you visit on our Website and the sequence in which you visit them; the amount of time that you spend on any given page of our Website; the Internet address of a Website that you visited immediately before visiting our Website; the Internet address of a Website from which you linked directly to our Website, if any; the Internet address of a Website that you visit immediately after leaving our Website; the type of operating system on your computer; the type of browser that you are using to view a Website. These and similar types of information may also be collected by “web-bugs,” single-pixel gifs, or other means. (a) Transaction Requirements: We sometimes contract with other companies and individuals to perform functions or services on our behalf. For example, we use outside shipping companies to ship orders, outside credit reporting agencies to assess requests for credit, and outside credit card processing companies to bill users for goods and services. These companies do not to our knowledge retain, share, store or use personally identifiable information for any secondary purposes, but we do not undertake to confirm, investigate, or police their practices. (b) Our Affiliates: From time to time, we may send your information to our affiliated companies, if for example, we believe that they may have information about franchising or other opportunities that may be of interest to you. (c) Joint Promotions: From time to time, we may join with third parties to provide specific services or products. When users sign up for these services or order these products, we will share only the names and other information that is necessary for the third parties to provide these services or products. These third parties are not allowed to use personally identifiable information except for the purpose of providing these services or products, but we do not undertake to confirm, investigate, or police their practices. (d) Business Transfers: As we continue to develop our business, we might sell or buy assets. In such transactions, user information generally is one of the transferred business assets. Also, if any of the BirdShack companies or substantially all of their assets were acquired, your Information may be one of the transferred assets. If you do not wish to receive telephone contact or periodic mailings or emails concerning new products and services or upcoming events, you may opt-out of receiving such marketing or promotional communications by sending us a written request to the address listed below or by following the opt-out instructions in the e-mail you receive from us. However, if you choose to opt-out of marketing or promotional communications, we reserve the right to contact you regarding your Website purchases, product information, technical support, any other matter that might affect our service to you, and/or your use of the Website or Member Areas, as applicable. You can ask to review, correct, update, or delete the information that we maintain about you, including your preferences, at any time by sending a written request to the postal or e-mail address set out in Section 10 below, or following the instructions in any promotional e-mail you receive from us. 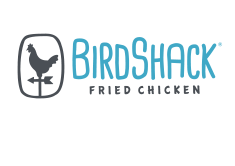 Additionally, users to whom BirdShack assigns passwords and usernames for Members Areas of the Website can correct or update registration information by sending an e-mail to info@birdshackchicken.com. We may take a reasonable period of time to respond. If you request the deletion or change of information on our system, such information may be retained for a period in our backup systems as a precaution against systems failures. Some information may be retained for longer periods as required by law, contract or auditing requirements. This Website and all information that you submit through this Website is collected, stored, and processed in the United States. We take reasonable and appropriate precautions to protect your personally identifiable information. Whenever you provide credit card or other financial and business sensitive information (to the extent such sensitivity is known) on the Website, we will take commercially reasonable steps to establish a secure connection with your Web browser, and employ a security technology knows as a secure-socket layer (“SSL”) to protect the transmission of such information to the Website. You can confirm that pages are using SSL by viewing the lock icon on the bottom of most browsers. However, as effective as our security measures are, no security system is impenetrable. We cannot guarantee the security of our Website or databases, nor can we guarantee that information you supply will not be intercepted while being transmitted to us over the Internet. We ask that you do your part, by maintaining any computer passwords you use to access the Internet or this Website strictly confidential. We reserve the right to change, modify, amend, and/or update this Policy at any time with or without prior notice and for any reason. Changes to this Policy shall be effective when posted. In case of any material change to the Policy, we will provide notice on the Website of any update to the Policy and post the updated Policy. You are responsible for reviewing this Policy each time you use or access any Website. You agree that continued use of a Website is an acknowledgment and consent to any terms contained in this Policy, as it may be amended from time to time.